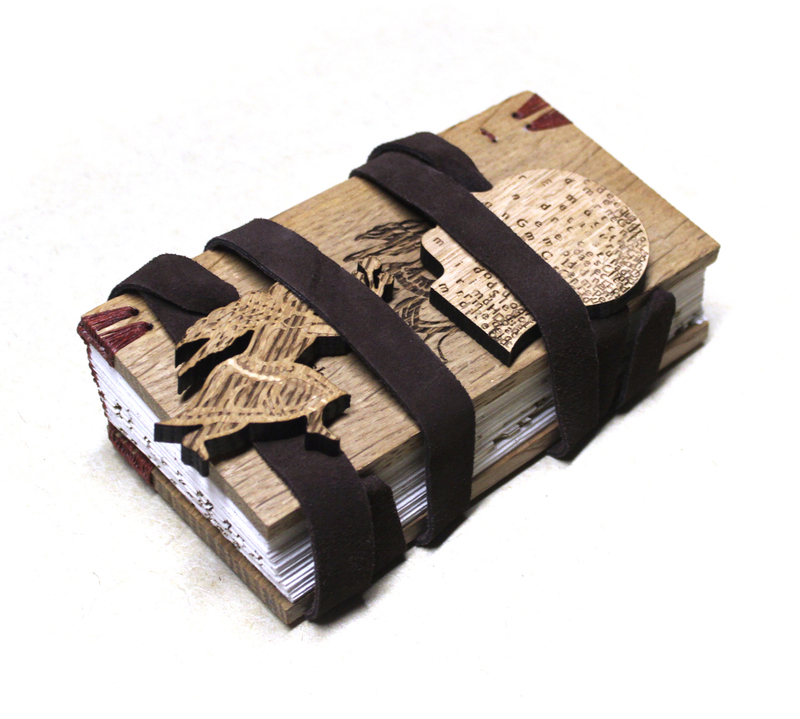 A view of the book with the laser-engraved wooden boards, the leather wrapping bands and the laser cut and engraved wooden clasps. Another view of the book with the leather bands unwrapped and the front cover. 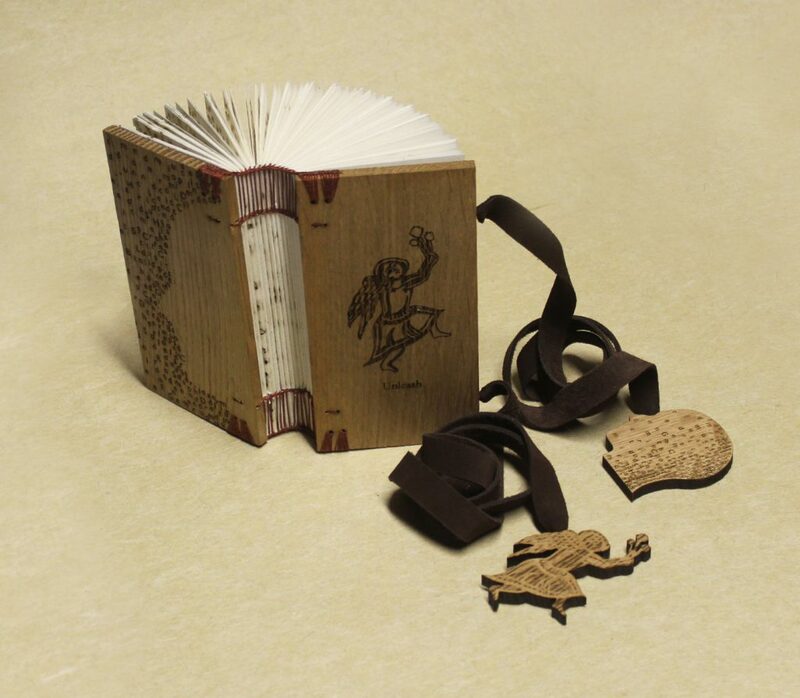 The book opened showing the front and back covers, the sewing, endbands, and the engraving on the front and back covers. 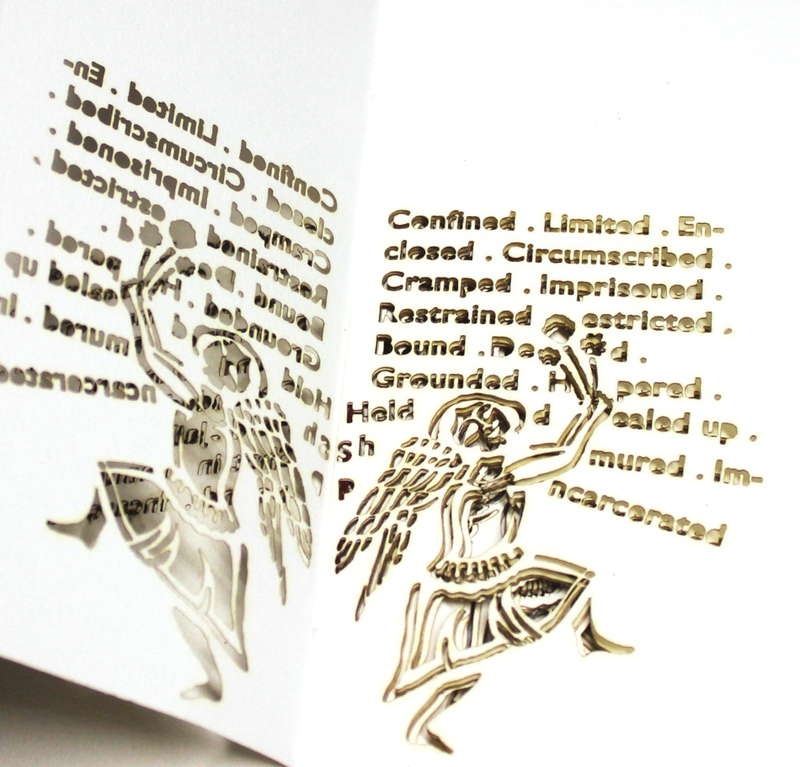 A detail of the book showing the angel’s attempt to break the words and get out of the book. When I make a historical book structure, I go through a learning process. I learn the history as well as the different physical aspects of the binding such as how a book form is constructed in a specific sequence. I learn about the use of different materials such as paper, wood, leather and dyes. I learn to make choices in selecting and replacing traditional materials that I don’t have access to. I use these different experiences to enhance my work in making artists’ books and to use historical and cultural references from these structures in the actual content. In essence, I wish to explore new ways to use the rich structures of historical books in contemporary artists’ book practice and incorporate contemporary content into strictly historical structures. Unleash records an angel’s attempt to leave the book. A journey that starts with words about being confined and restrained, the angel appears and slowly makes a path through these words until succeeding to break the phrases and get out of the book. 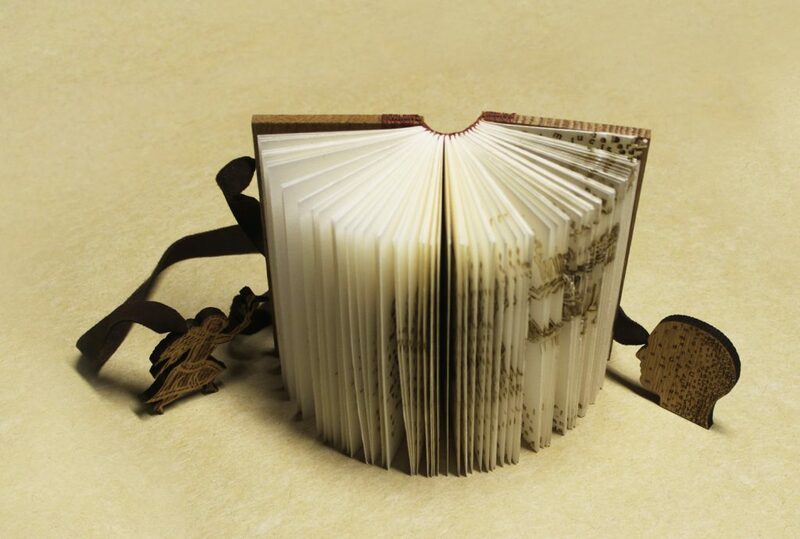 When the angel disappears from the book, the letters of the broken words start forming a human face. 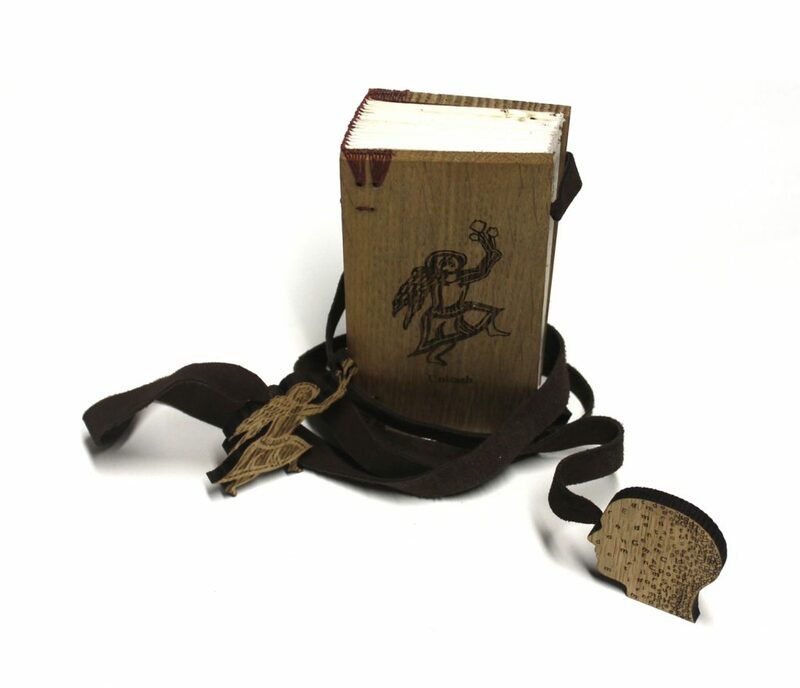 By using a late Coptic binding with straps and clasps, the book structure echoes its content. One wrap has the angel on the wooden clasp; the other wrap has the human face.